This year's survey continues to report on salary and bonus data, along with compensation and benefit information including insurance coverage, paid time off, retirement plans, turnover, work – life, etc. 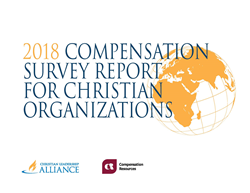 Compensation Resources, Inc. (CRI) and Christian Leadership Alliance (CLA) have released the 2018 Compensation Survey Report for Christian Organizations. This year's survey continues to report on salary and bonus data, along with compensation and benefit information including insurance coverage, paid time off, retirement plans, turnover, work – life, etc. The data is reported in 8 Christian-based industrial classifications, and also by revenue, employee size, and region, to provide the user with various means by which to examine and evaluate results. Results are based on data provided by 84 participating organizations. To learn more about the 2018 Compensation Survey Report for Christian Organizations, or to order the complete report, please contact Diana Neelman at (877) 934-0505 x105. You can also visit CRI's website at http://www.CompensationResources.com for more information and to download a free sample of this year's survey. About Compensation Resources, Inc. (CRI): CRI provides compensation and human resource consulting services to mid- and small-cap public companies, private, family-owned, and closely held firms, as well as not-for-profit organizations. CRI specializes in executive compensation, sales compensation, pay-for-performance and incentive compensation, performance management programs, and expert witness services. About Christian Leadership Alliance unites, trains, and equips Christian leaders to think higher for greater kingdom gain. CLA moves beyond good Christian management to empower Christian leadership that is catalytic in its transformation of people, their organizations, and ultimately the world. CLA is an alliance of mission focused Christians who lead in today’s high-impact Christian nonprofit ministries, churches, educational institutes, and businesses. For more information about becoming a member, please contact CLA at (949) 487-0900 or visit us at http://www.ChristianLeadershipAlliance.org.